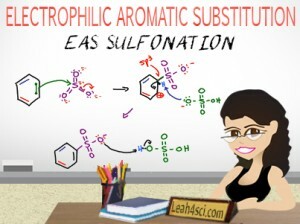 Aromatic Sulfonation is an Electrophilic Aromatic Substitution (EAS) reaction which adds an SO3H to the benzene ring. This reaction can be carried out starting with SO3, or creating SO3 using a heated H2SO4 solution. The video below shows the complete mechanism from creating a super electrophile (SO3) to sigma complex and reforming the benzene ring. This is Video 5 in the Electrophilic Aromatic Substitution Video Series. Click HERE for the entire series.